Kitsch: Why I can’t do minimalism. I blame my love of kitsch for my inability to be a Minimalist. The concept of being a Minimalist is bang on… I understand the benefit of keeping things simple, keeping the feng shui moving around the house and feeling more liberated with less stuff – but it’s just not for me. Sometimes I call myself a vintage collector, sometimes a hunter gatherer and sometimes a hoarder. Either way – if this beautiful stuff didn’t make me happy I might have been the type of person who could thrive with bare minimal possessions… I could live in a house that looked like everyone else’s and was easy to clean… but I choose to surround myself with beautiful stuff. Beautiful might be a stretch… You see, I have a thing for kitsch. Kitsch is defined as “art, objects, or design considered to be in poor taste because of excessive garishness or sentimentality, but sometimes appreciated in an ironic or knowing way”. I should be ashamed of it – the tackiness of it. But I’m not. Part of me is proud of saving this stuff (that has stood the test of time) from landfill. Part of me is proud of having a unique home that was sourced for next to no money from opshops. Most of our decor is 1950s-1970’s so there’s stories with pretty much everything we have. Not even just our stories but other people’s stories – passed on at garage sales; markets or through nostalgia for a common item. I should be ashamed of spending our little disposable income on stuff… but I’m not. As you can see – one of my kitsch collections is shell art. Everyone seemed to make random little shell objects back in the day including most tourist shops… My particular favourite in that image is the mermaid. Queen Elizabeth II; Ballerinas (Carlotta Edwards); Ducks/Swans (Vernon Ward) and Religious icons were all really popular in the 1950’s. So there’s lots of those sprinkled around our house. The vintage ballerina alarm clock was my Great-Grandmother ‘s so it’s extra special. Ella’s not allowed to touch it. There’s a religious corner – and a “bad taste” (often considered racist) shelf -with my favourite pieces of German Pottery (not kitsch – but of the era). That’s only a smidgy part of that collection – I’m fond of Black African lady ornaments – one of my ‘prized possessions’ is a lamp that one of my Teacup customers tipped me off about after she saw it at Restore (Bryant Road). Speaking of “racist” memorabilia. Native Affairs shared this article earlier in the week. “Aboriginalia and the politics of kitsch”. It was interesting – but hasn’t made me hide the pieces I have. You guessed it, the kitsch spills outside. I took these to show Ian Duggan who wrote this article about gnomes in New Zealand gardens… Well worth a read. The one at the front (who is missing his fishing line) was James’s Grandmother’s and the one with the watering can was my Nana’s (we brought it up in our luggage from Dunedin after finding it lonely in the yard after her house was sold). Needless to say – the dump has given us even more friends. So – kitsch. It’s the reason I can’t do minimalism. I would love to see your kitschy items!! Please feel free to share your photos and stories with me. Taking the train from Britomart, Auckland to Hamilton city – I didn’t really know what to expect. Friends who had visited a decade prior advised me to avoid what was arguably the most boring city in the world. But, since it was on the main trunk line south and coincided with one of my favourite indie bands being in town I decided to risk a night… how bad could it be? Unlike expensive and logistically nightmarish transfers I’ve had in other cities – the fact that you walk out of Hamilton central’s underground station and on to Victoria street where most of the accommodation choices are meant it was off to a good start. My hotel was literally across the road; in the centre of town with a river view. Win. After offloading my pack, I asked the reception where I should go to begin to explore the city. She sent me to the Waikato Museum, to catch the free walking tour bus which runs Friday – Sunday. I’ve got to admit – walking from hotel to the Museum, wasn’t particularly spectacular. Apart from some obviously new developments – it looked like any other city I’ve been to, though there were some nice heritage buildings – freshly painted and flower baskets hanging from awnings above trendy cafes and bars. (I was also pretty excited to see the Riff Raff statue, but since I was running late I decided to come back later). The walking tour – was surprisingly good. It was free so I couldn’t complain, but the friendly host – an Hambassador, I think she was – took a group of us, along the river – pointing out where a new pedestrian bridge was being constructed next year to reach Memorial Park in the East. We wandered through the new Ferrybank arts precinct, which ran along the river and up to Victoria street – I was mesmerised by street performers and thought how lucky Hamiltonians were to have two theatres in one area. 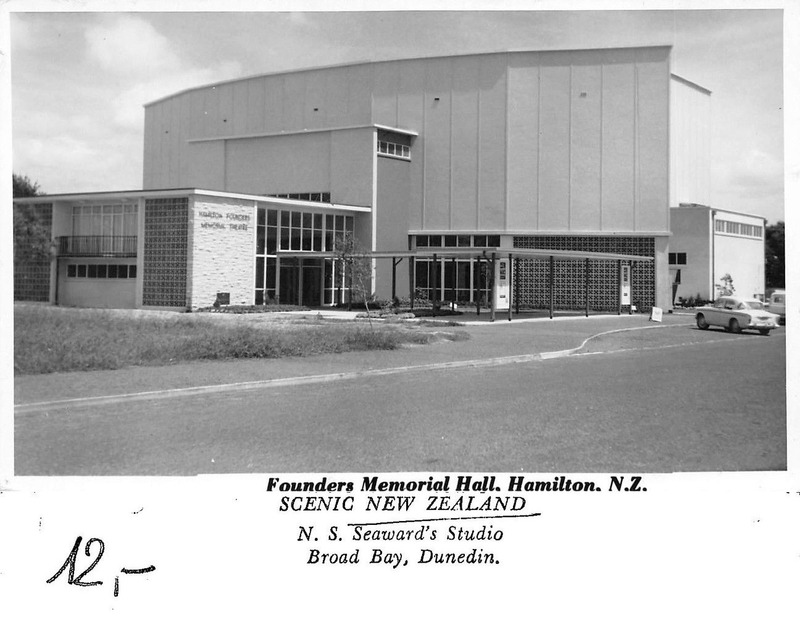 A larger one called “the Founders” being finished soon and the Meteor theatre, which had been refurbished and was thriving for community performances. She pointed out the Waikato Brewery building which had been converted into trendy eateries, St Pauls cathedral and parks of interest like the Band Rotunda – which thousands flock to for free jazz sessions every Sunday afternoon! At this point I opted to hire a bicycle from the Ferrybank info centre and joined the daily cycle tour from the city to the Hamilton gardens through Hamilton East. Our guide was busy telling stories of the cities past on our way along the river – with a few loops to capture buildings of interest like Euphrasie house – which apparently came really close to being demolished. It was also really interesting to check out Beale Cottage – the oldest house in Hamilton, and Greenslade. Apparently the council decided to focus on restoration and preservation of houses of note in the city. The Hamilton gardens is world famous and did not disappoint. I was blown away – and could easily have spent a lot more time there had it not been for being distracted by the food trucks that set up at the gardens from Friday to Sunday nights. I was grateful for the free wi-fi because I wasn’t sure if my memory card was going to hold all of the photos I was taking. Dropping the bike off back in the city, I wandered along the path back up to the hotel to change for the gig. I’ve travelled enough by myself to not care about being by myself at something like this but found the people so friendly and unpretentious that I made a heap of new friends. As soon as people hear you are from out of town they become animated in the “things you need to check out” including beer recommendations – they’re proud of locally crafted brews here. Apparently the underground music scene is really big here too – and they tell me they have a couple of central city festivals a year – so I’ll be back. I took breakfast at a little cafe at Victoria on the River – just down from the hotel. Something I noticed was that the really cool things in this city are hidden. You really have to ask someone, or pick up a map – but it lends itself to being part of the charm. This city is so underrated that it’s cool. After breakfast I wandered around the city to check out some of the Boon street and public art from a map and guide I was given at the gig last night. I was stoked to hear acoustic music coming from the stage when I got to Embassy Park. With kids, families and older people sitting around enjoying the sun I could imagine it being a great place to live. The coffee I had while I was people watching was one of the best I’ve had too. With an hour left, I browsed the vintage and artisan craft shops tucked away in their laneways – I also managed to catch a weekly market in Garden Place – with even more entertainment happening on a stage. By now – I’m starting to feel guttered that I didn’t plan longer here – I’ll have to hit up my friends who said it was dull. With sadness, I walked back down to Hamilton central to get back on the train to head south. Vowing to return one day soon. The Founders theatre was built to last 50 years and it did. The sudden closure is a sad example of a lack of earlier action by the Hamilton City Council to keep it going until refurbishment/replacement could occur in a seamless fashion. However, while we can play the blame game, because it makes for more interesting reading – I prefer to concentrate on “where to from here?”. The HCC has initiated a period of consultation with the public and offered three options. Restore, Rebuild or Demolish. My initial reaction to news of it’s closure; was to conserve the existing building. I strongly believe that buildings help add character and tell a story in a city – except…. the Founders Theatre isn’t old enough…. or architecturally attractive enough to warrant this. I couldn’t find a lot of support for the theatre being saved on heritage or nostalgia basis which led me to reconsider my initial position. The use of ratepayer (or taxpayer) money for the arts is a contentious issue, it probably always will be. The cost of a complete rebuild is about $50 million dollars (or $69 per year for 20 years for ratepayers). That is a heck of alot of money – especially when the median income in Hamilton is $27,000 a year. I can understand why some people or parts of the community don’t think it’s appropriate to spend on non-essential services given our housing crisis and growing inequality are more pressing. However, the Council has a role to play in ensuring they provide facilities congruent to what any other comparable city would have – this includes a suitable theatre. This is why demolition isn’t an option to me. While a restoration (which is still preferable to demolition with no replacement) is alot less at about $20 million dollars, I don’t think a refurbishment would cater for “future Hamilton”. Effectively an “expensive” band-aid. I think we need to start thinking bigger and more towards the future (100 years). It’s cheaper to build it now than it will be in the future. So if we can start from scratch – we can create a venue with thought given to the longer term. It’s time to be excited about the future. The existing “plans” for Ferrybank aren’t particularly intriguing and I’m doubtful that developing for the sake of it would be beneficial for the city. Despite how much I like Ferrybank and want to see the river utilised, I would not have voted for the Ferrybank development as proposed earlier this year. A concrete anchor project would make it meaningful. This argument hasn’t even touched on the most important aspect which is our wonderful arts community whose contribution to our city cannot be underestimated. We MUST show support for the musical, theatrical, artistic and creative minds who offer so much of themselves to our city every day. They create a city worth living in and a grass roots entry for the Waikato’s high calibre creative minds and young people. Our future. I’ve just submitted the online form to “Have my Say” in the future of the Founders theatre. Consultations are open until June 30th so if you have an opinion please make sure it counts by submitting the form too. I have put my hand up and am running for a seat in this year’s local body elections. If elected in, despite my personal view (above) that we need to rebuild – I believe this decision is one that needs to be led by “the average Hamiltonian” and would vote according to the submissions received and public opinion. It’s your city – you need to have your say. Well the rumours are true. Hamilton’s Railway buildings on the corner of Victoria and Ward street are coming down. I guess we all knew it would happen. I kept hoping that they would be earthquake strengthened and repurposed. Sure, it would take a little imagination, but it could have been beautiful given the chance. It’s being demolished to make way for a new-build. Hello to… another Bank. It’s always a bank… a supermarket, or a gym. I’ve always had a bit of a soft spot for this building’s architecture. Look, I KNOW that the building had been under-utilised for a long time. If Kiwi property income were letting the rooms upstairs out to artists and musicians over the last decade it’s a sure sign that they’re not particularly worried about the building. I spent a few really awesome nights at gigs upstairs several years ago. Come to think of it I’d be interested in how many local bands started out in those rooms. 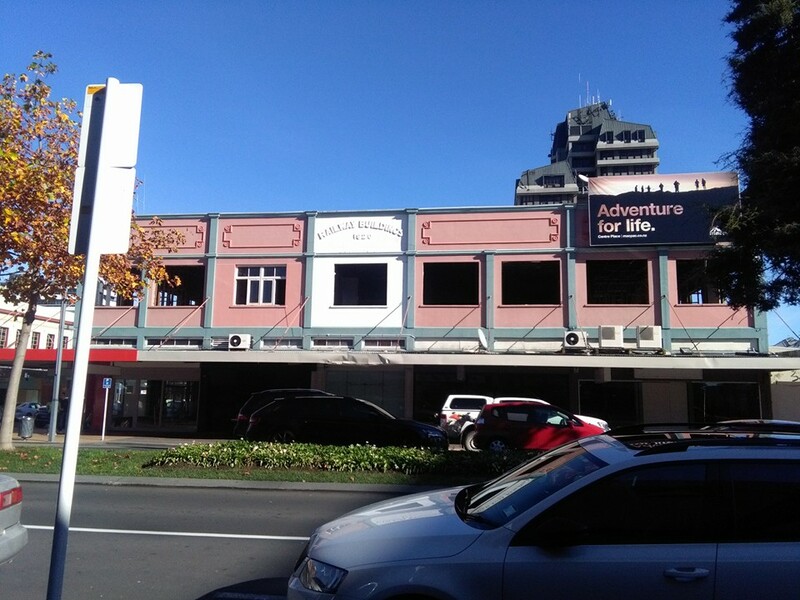 The buildings sold more recently to Tainui group holdings – who haven’t been renewing the street front leases in the last few years – which is a sign in itself that something was about to happen. Of late I noticed they’d started “work on it”. I thought – ‘this looks promising’. But, then… the more gutted it became, the more worried I got. I started making enquiries over the weekend as to the future of it. I’d always naively assumed that if it was going to be demolished completely that we (Hamiltonians) would know. I was wrong. Yes I agree a new building and business benefits the city, as it brings new people into the central city for work every day – a win for the businesses directly around it. Yes it is great because they’ll do their shopping on their lunch-break instead of at the Base on Saturday. But, it’s not a complete win as far as I’m concerned. Was there no way to save this part of Hamilton’s heritage? I would much rather developers were creative and refurbished to keep the exterior as intact as possible. Unfortunately business and retail aren’t the only things that build a great city. We’ve had some awesome work done with the Central City Transformation Plan and the River plan, but – we’re still missing our heritage and arts. They are key components you need to create, identity – vibrancy and community to a central city. Leaving the facade of the Railway buildings (and any other Victorian building in future) would help for people to feel a connection with the city. You cannot do that with new-builds. Hamilton has a reputation for destroying our heritage – but it’s not too late for what we have left. If not for sentiment – but for character and identity. It is however, too late to stop the Railway building coming down, and I am actually really saddened by it. But there’s no point playing the blame game here. Hamilton can and will be a great city – we just need the right people working to bring it all together. Add: Today the Hamilton City Council announced a $100,000 fund to help owners of listed properties, as part of the Heritage plan. This is a great step in the right direction. It’s been just over a week since I made public, my intention to run in this years local body elections. I’m running for the Hamilton West ward – with “election day” on October 8th 2016. For the next month, there isn’t really anything that I have to “do” per se. More – just get my head around my campaign and to start to communicate to the public who I am and what I’m all about, by the power of the written word. I’ve decided to take you on the journey by sharing the things I’m learning as I go. So far, I’ve started a facebook page – and will be blogging here. Online mediums are paramount when you are on a budget like I am. I learnt this when advertising and promoting Teacup and Saucer and Ferrybank Market. SMILE and the camera smiles at you – cringe and you’ll look demented. I’m always on the other side of the camera – and being photographed makes me cringe, literally… which makes me look ridiculous and awkward in photos. I was asked for a “professional photo” for an article Hamilton News is doing regarding my intention to run. James took one for me… it was “ok”, as in my eyes were open, but I still spent half a day trying to photo shop out my wrinkles and blemishes (with my zero photo shop skills) before I gave up. On Friday I went into the Hamilton News office to have Ged take one for their article. I have to trust that I wont look like a complete doofus, since I don’t get to check the version he uses. Time will tell. So, getting comfortable in front of a camera will be a challenge for me to face in the near future. It’s not as if a Councillor gets paparazzi’d but it’s fair to assume I will need to learn not to grimace at the camera. I have been told by two incumbents so far, that the choice of professional photo you send in with your nomination form is one of the most important things you will do. The nails behind my head – not a good look…. (easily removed a la photoshop). The tongue and groove is also a no-no, too distracting. I managed to keep my eyes open though… win! How to. A professional photo is important. It may be the only visual people have of you before they vote. You need to be tidy and “ready for business” but be warm and smile genuinely. I’m going to go in search of a photographer who can take on the challenge of ME to get a series of photos I am happy with. I’ll need to do this within the next few weeks. Stay tuned. They can’t knock it down! On that note – I have fond memories of nights spent upstairs at the Railway buildings when it was let out to local musos for practices. They’ve been closed off for a while and last time I asked (about a year ago) – they were being earthquake strengthened. When I saw the building on Friday – I started to really wonder if that was the case… they look like they are being completely gutted. I don’t want to jump to conclusions, but I did start a process of finding out facts about what is happening – and will inform you as soon as I know more. How to. A Councillor is expected to research, interview and find answers for the matters that concern them and their constituency. While genuine passion and personal preference is important in decision making (to stay true to yourself) the needs/wants of other parties needs to be considered. Listening with an open mind (free of agenda) is key. Our city is cool… really! I shared these photos on Friday – after a lunch in the central city to celebrate James’ birthday. While no-body needs to ask me twice to go to a market – I also went to the Queens birthday market at Frankton School today. I was excited when I read about the market, because their aren’t too many community events in our area (Dinsdale). I also believe that as a Councillor you should be attending as many of these events as possible, so I’ll be making a habit of getting to as many as I can. This is not just to give you more of a chance of being elected/ re-elected, but it allows people to feel that you are approachable and that the Councillors are a part of the community and not just a group who exists within the council chamber. How to: A big part of being a city Councillor (in my opinion) is being a genuine advocate for our city. Genuinely loving the city shows – with your passion, promotion and support of local people, events, places, initiatives and future.